The New Jersey Business & Industry Association joined state officials and county college representatives Tuesday at an aerospace equipment company to celebrate the success and 10th anniversary of the NJBIA Basic Skills Workforce Training Program, which has trained more than 113,000 workers for 7,509 different New Jersey employers over the past decade. 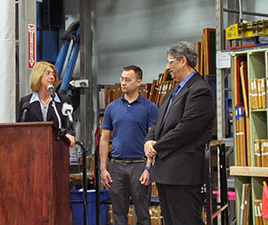 NJBIA President & CEO Michele Siekerka speaks with Zodiac Aero Evacuation Systems employees at a press conference to mark the 10th anniversary of the NJBIA Basic Skills Workforce Training Program. Sivaraman Anbarasan, executive director of the NJ Community College Consortium for Workforce & Economic Development, praised NJBIA for its vision in creating the grant-funded program back in 2007. The results and economic benefits were so impressive that after the first two years, the state established dedicated funding for the LWD grant program, which is open to all private-sector employers at no cost to the employees or the companies. The consortium manages the program, which recruits, trains and certifies employees who are in need of training in computer skills and business software, communications, English and Spanish speaking skills, and mathematics and measurement. NJBIA, which has 20,000 member companies employing 1.2 million workers, does outreach to businesses and employees who can benefit from training, and the LWD provides funding and fiscal oversight. The news conference was held inside the factory of Zodiac Aero Evacuation Systems, a Wall Township manufacturer of inflatable evacuation slides and life rafts used by commercial airliners. Neil Cavaleri, vice president of manufacturing, said many employees have utilized the Basic Skills Workforce Training Program over the years to upgrade their skills. After completing the basic skills training program, some go on to take advantage of Zodiac Aero Evacuation Systems’ college tuition reimbursement policy to advance in their careers at the company. Employees gathered on the factory floor for the event included Juan Diaz and his wife, Carolina. Juan began his career at Zodiac Aero in 2006 as a packer. After completing a Basic Skills Workforce Training course for workers learning English as a Second Language (ESL), he was able to enroll in Ocean County Community College where is he is studying for an associate degree in engineering. He now works as a technician in the company’s engineering group. Carolina Diaz, who also took the ESL basics skills course after joining the company in 2010, is a quality control inspector and studying for her MBA at Stevens Institute of Technology. Congratulations to NJBIA and the Community College Consortium for your success in providing needed training to NJ’s workforce. May this partnership continue for a long time to come.